Improve your company’s green initiatives and start saving thousands each year by switching to commercial solar pool heating. 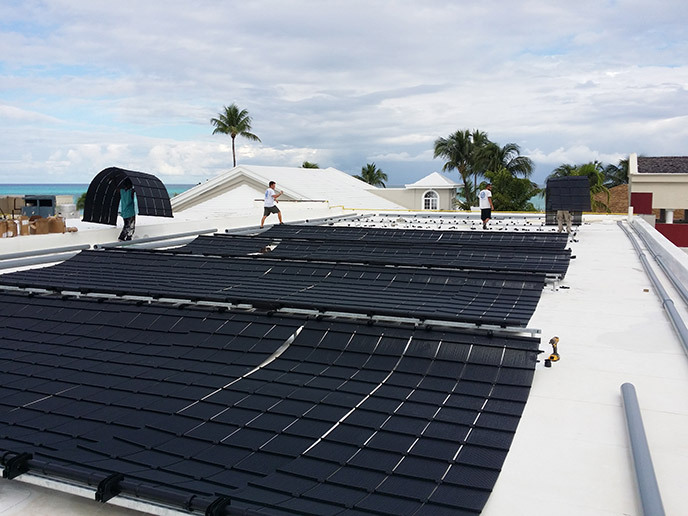 Solar pool heating is an efficient and cost-effective way to enhance your organization's green initiatives while also cutting your energy expenses. 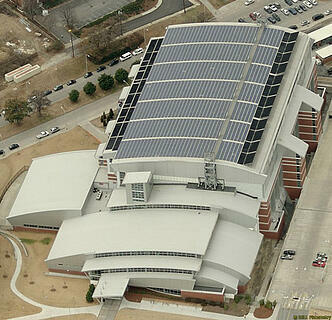 Superior Solar has been installing commercial solar pool heating systems for over 25 years on many facilities, including the 1996 Olympic pool in Atlanta. We've helped numerous organizations cut their expenses while also becoming esteemed and environmentally-conscious businesses. Why Choose Solar Pool Heating? Zero operating costs. Renewable energy from the sun heats your pool, so no additional energy is needed to power the system. Become a greener company, without the expense. Heat for less. Pool heating systems pay for themselves within just a couple of years. If you have a commercial pool that is currently gas-heated, adding solar to your gas-powered heater will produce tremendous savings. Quality equipment. Heliocol solar panels produce more energy, last longer and are better suited for the large scale applications than any other solar pool product on the market. That’s why they're the only panels we offer. No maintenance. Heliocol panels are built to last up to 20 years or more, require virtually no maintenance and are backed by the strongest industry warranty so that your commercial investment is protected. Clean power. Solar pool heating systems emit no air pollution whatsoever. Reduce your company’s carbon footprint with solar pool heating. Our solar pool heating systems are completely autonomous. Once you set your desired temperature, sensors will monitor your pool’s water temperature and the amount of sun available to the solar panels. If the water needs to be heated, the solar valve opens and diverts the pool water to the solar panels where the water is heated and sent back into the pool. This process is repeated until the pool reaches its desired temperature. Remote metering and monitoring solutions are also available for real time QC & PR. We are the exclusive provider of Heliocol solar panels in the Central Florida area. Heliocol solar panels produce more energy, last longer and are better suited for the Florida climate than any other solar pool product on the market. Certified for some of the highest wind loads without hurricane straps, leading to significantly less roof penetrations. Most recommended solar system by roofers. Most requested solar panel by insurance carriers for replacement of solar panels affected by high winds. Unlike competitor systems, there are no hoses and metal bands to regularly retighten. Patented gator clamps allow Heliocol panels to be mounted directly into the trusses, ensuring reliable penetrations and eliminating the need for unsightly and unreliable straps. Lowest back pressure available on the market. Individual tube design allows for proper evaporation of rain. Individual tube design maximizes the coverage of the roof space by enabling separation of tubes to work around roof obstacles. Heliocol is the only solar panel appropriate for flat roofs. Outstanding customer support: from sales to installation. "Superior Solar is one of the most professional companies I have dealt with. From the estimate thru installation to after sales they have been superb. I would recommend them to anyone"